The Streaked Weaver was formally described by Thomas Horsfield, an American physician and naturalist. Horsfield lived and worked on Java Island in Indonesia from 1811-17. Horsfield began to collect plants and animals on behalf of the governor and friend Sir Thomas Stamford Raffles. In 1816 Java was restored to the Dutch and Horsfield moved east to Sumatra. In 1819 Horsfield left Sumatra due to ill health and returned to London. On returning to London, Horsfield continued to be in contact with Sir Stamford Raffles and became a keeper of the museum of the East India Company. He stayed in this position, later as a curator, until his death in 1859. Ultimately the Museum was overwhelmed with collections, and much of the material had to be distributed to other museums, scientific societies. One specimen of the Streaked Weaver is still in the British museum at Tring, but there are probably 3 more type specimens. 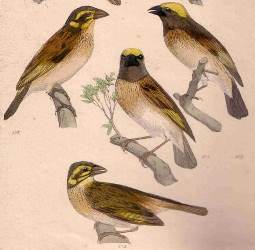 The first illustration of a Streaked Weaver is a line drawing of the head and bill in Swainson 1838. The next illustration is a set of birds painted in colour by Reichenbach (1863). Fringilla manyar	Horsfield 1821	Trans. Linn. Soc. London, 13, p.160	Java. manyar Tamil (Sri Lankan) name manja for various weaverbirds. Brahminee Baya (Jerdon 1845). In 1840, Jerdon had applied this name to the Bengal Weaver, but then realised that it should apply to this species. Brahminee Baya, Burmese Streaked Weaver Bird, Indian Streaked Weaver Bird, Javan Weaver, Manyar Weaver, Striated Weaver. Between 1811-17 when Horsfield was collecting on Java. At least one syntype is in the British Museum (BM 1880.1.1.4730). Identification. The Streaked Weaver Ploceus manyar breeding male has a golden crown, black face and throat, and the underparts are white with black breast streaks. The non-breeding male and female are dull with a buff eyebrow, and lightly streaked breast, distinguishing them from the other Asian weavers. The juvenile is buffy below with indistinct streaking. P. m. manyar occurs on Java, Bawean and Bali Islands (see red on map). 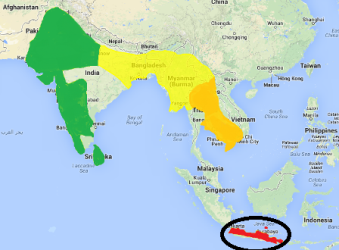 P. m. flaviceps occurs from Pakistan, through India and Nepal to Sri Lanka (see green on map). The male of this race has the face mask and streaking black, rather than brown, the crown is paler yellow, and the breast and flanks are paler. P. m. peguensis occurs in India, Bangladesh, Bhutan, Myanmar, China (W Yunnan) and Laos (see yellow on map). This race has very heavy black streaking. P. m. williamsoni occurs in Thailand, Cambodia and Vietnam (see orange on map). This race has the side of the head and streaking brown, rather than black. 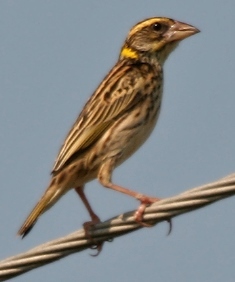 The Streaked Weaver has been introduced in Egypt along the Nile Delta, where it breeds regularly. It has also been introduced in Japan. Breeding has also been recorded in Saudi Arabia, United Arab Emirates and Bahrain, presumably by captive birds that escaped. Habitat. The Streaked Weaver inhabits wetlands, reedbeds and rice paddies, often with bulrushes, and it often associates with elephant grass. Food. The Streaked Weaver feeds mainly on seeds, including those of the grasses, rice, wheat, millet and sorghum. In some regions it causes significant damage to rice crops. Nestlings are fed mainly with insects, especially grasshoppers, and also caterpillars, beetles, spiders, and small snails. 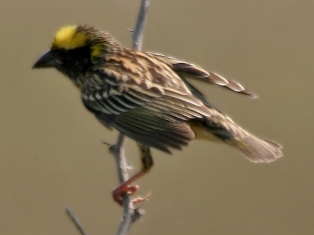 The Streaked Weaver forages in flocks, often with other weavers. It forms daytime roosts near its feeding grounds during the hottest months. In the non-breeding season, it forms communal roosts in reedbeds and sugar cane. Breeding. The Streaked Weaver is apparently monogamous, with occasional polygyny recorded. It is colonial, with 15-50 nests at one site in Java. It may breed in mixed colonies with the Black-breasted Weaver (or Bengal Weaver), or alongside Tricoloured Mannikin Lonchura malacca nests. The nest is retort-shaped, woven on to leaves of supporting plants. There may be an entrance tunnel as long as 30 cm or it may be absent. 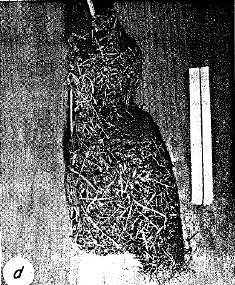 The nest is woven by the male from strips of reed or palm leaves. The female adds nest lining of fine grass stems, although some breeding nests are unlined. The nest is placed above the water surface in reeds and bulrushes, or in elephant grass. Nest sites also include palm trees (especially in Java), or mangrove trees, or suspended from vegetation growing out of sides of irrigation wells. Often small lumps of mud or clay are added to the sides of the nest entrance. Yellow acacia flowers may be added to the nest as decoration. Nests may be placed near wasps as protection. 2-3 white eggs are laid. The female does most of the incubation and feeding of the nestlings. Nest predators include snakes and crows. In reedbeds, many nests are destroyed by grazing cattle and by people harvesting reeds. Small birds, eg Indian Silverbill, and the long-tailed tree mouse has been recorded to take over old nests of the Streaked Weaver.